A few nights ago, after a fun time at Jim Araneta’s Global Beer Exchange, A few of us decided to grab a bite to eat before heading home. I was with C, Kitchyart and her friend M. Kitchyart suggested that we go to a squid ball vendor who she has been frequently visiting along Makati Avenue. I agreed immediately since I haven’t had fish balls or squid balls since I was in high school. We found Mang Julie (short for Julius) across the Barrio Fiesta building. He was selling squid balls for P3 each. These balls were larger than the usual fish balls but had a similar taste profile. Dipping sauces are the classic vinegar, sweet and, spicy. I remember during said high school days eating fish balls, although they were tastier and cheaper than the swill that passed for canteen food, was actually banned because of sanitary reasons. Double dipping was de rigueur and thus, detrimental to ones health. Nowadays, double dipping is not an issue anymore. Squid balls are now served in either a disposable cup or plate, while sauces are spooned in gravy style. My favorite sauce has always been a mixture of sweet and spicy while I prefer my squid balls to be “tostado” or well done. I initially ordered 6 balls. I took my first bite and it immediately evoked memories of Harry Gasser and Holden Caulfield. It was just as I remember, deep fried chewy goodness and a sauce that had hints of brown sugar, cornstarch, banana ketchup and chilies. Sarap! If you are craving for a satisfying quick pick-me-up that does not break the bank, look no further. Available Daily from 4pm till late. Hi Ines, You are right! Thanks for stopping by. Nice! 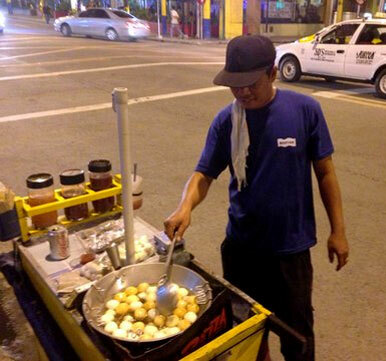 Now I know where to find manong fishball :D ! It is kinda hard to track down meals on wheels. How did Holden Caulfield come into the picture? Sorry. My Salinger is not so good anymore hehe. Hi Ray, I mentioned Holden Caulfield because it was at about that same time when I first read Catcher in the Rye. A definitive moment for me since it cemented my love for reading. Thanks for stopping by.